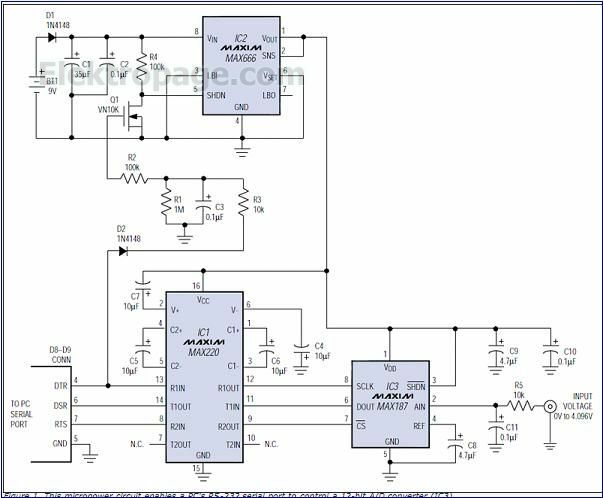 Abstract: This application note provides an example of interfacing an A/D converter to a PC using a standard serial port. The CS lines and SCLK lines are emulated by the RTS and DTR lines respectively. Conversion data appears on the data-set-ready (DSR) line. code is given to demonstrate the application circuit. The circuit shown in Figure 1 performs a task usually carried out by a microcontroller—that of driving a 12-bit A/D converter (ADC) from the serial port of a PC. Power consumption is low: The 2mA operating current drops to only 15µA in shutdown. Figure 1. This micropower circuit enables a PC´s RS-232 serial port to control a 12-bit A/D converter (IC3). You are writing as anonymous comment, if you are a member please login.